Today I went to Palomar Mountain. I began and ended my ride in Encinitas. This used to be my weekly long training ride when I lived there. The stats are simple 100 miles with 10,000 feet of climbing. It’s the perfect century in my opinion. 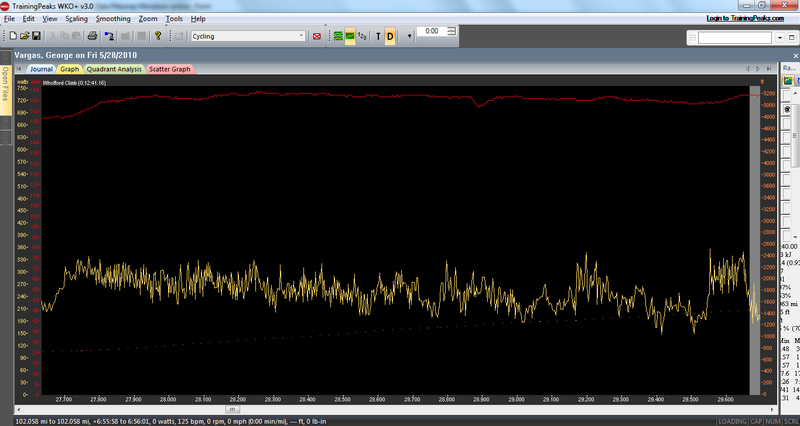 It has rolling terrain, some flats (not much), lots of climbing and descending. Along the way you ride through the micro-climates that make San Diego weather so famous. First you start in cool coastal weather, then you experience the heat of the inland area and of course the mountain climate as you crest Palomar Mountain at 5250 feet of elevation. Lastly, you fight a headwind all the way home from Palomar. You are heading in a general westerly direction the entire leg home. I’ve always loved this ride but living in Orange County I don’t get a chance to do it often. Actually, I can’t remember the last time I climbed Palomar Mountain. I rode at a good pace for the majority of the ride. And then I got to Palomar. My gearing choice was too tall and I struggled through the orange groves where the steepest pitches of the Palomar climb lie. 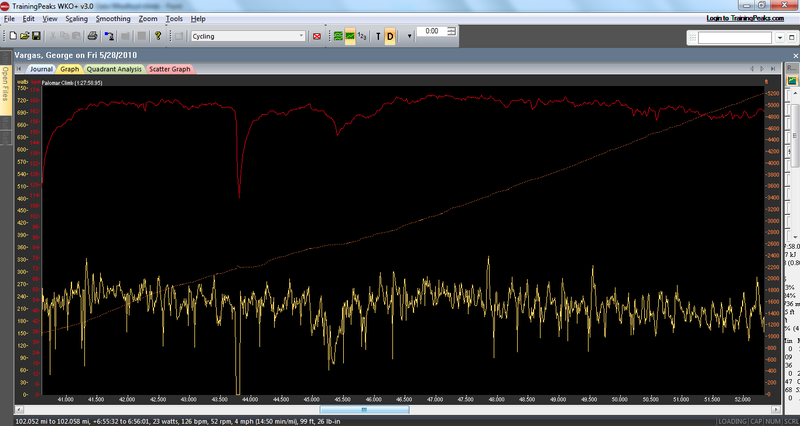 I rode the 11-23 cassette that I have been riding throughout the year in races and training and it was a little tough. Who knows if it had anything to do with cumulative fatigue from yesterday’s 3+ hour climb to Dawson Saddle. I should return to Palomar with an 11-25 cassette next time. I think the two extra teeth will make a big difference. I’m a stronger rider now than I was a few years ago but the big difference is I’m lighter. My weight loss has made a big difference in my riding in particular my climbing. I try to maintain my weight under 150lbs. By comparison, when I started Ultras I was 170lbs. Sadly, I was actually 185lbs at my portliest. 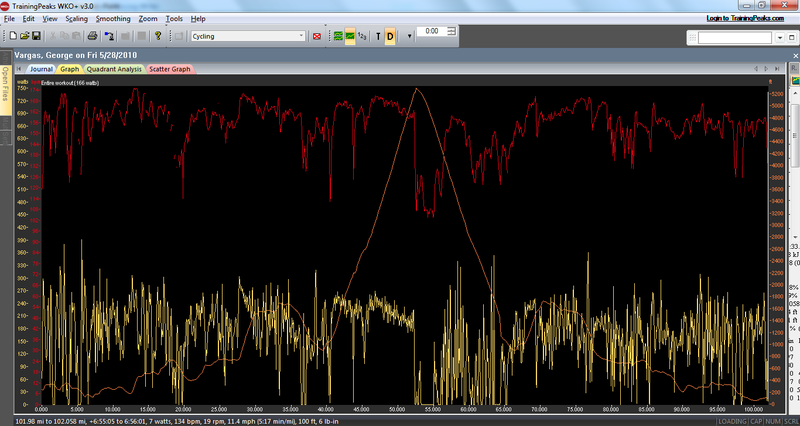 Above is the data for the Lake Wholford climb. It was featured on the Palomar Mountain stage of the Tour of California last year. It is a two mile climb that has a steep first mile. After that it is about 7% for the second mile. If you are going out there to time yourself I start my timer as soon as I make the turn onto the road and stop my timer at the paintball park entrance. And now for some techno-babble Shimano Dura-Ace makes an 11-27 cassette for their new 7900 series. I know I will need that ratio on Towne Pass when I do the Furnace Creek 508 in October. What I would really like to use is an 11-28 cassette. When I buy my SRM I will buy a standard 53/39 crankset and it would be nice to have the 28T since I won’t be able to afford a compact SRM AND a standard SRM. But alas, the rear derailleur for the electronic Dura-Ace aka, Di2, that came equipped on Felicia does not accommodate an 11-28 which would be really sweet on Towne Pass. I guess I just have to get stronger eh? I had a front flat on the lower slopes of Palomar. It took over five minutes to change the flat because I couldn’t find what caused it. I took my time inspecting the tire and tube before installing the new one. My legs started to fade on the upper slopes and I slowed down considerably. My total time on the climb was 1:27:58. I’m going to have to work on that. I start my timer at “the store” and stop it at the intersection of East Grade Rd and South Grade Rd. Part of the reason I faded was the 11-23 cassette on the lower slopes and some of the work I did earlier on the foothills leading up to Palomar. One interesting thing is I only saw one other cyclist on Palomar all day and guess what? It was Mark Ely, a client and friend that I have sold things to throughout my years at Nytro — notably a bike, a Cervelo R3. Two things threw me off on today’s climb. The first one was the elevation signs for the 2,000 and 3,000 feet were missing. I don’t know why they would remove them but they weren’t there. I had a general idea where they should have been but I wanted to mark my lap times at each thousand feet. The 4,000 and 5,000 feet signs were still in place. I thought it was odd that not all the elevation signs were in place. The second thing that threw me off was I had forgotten the mile marker for the top. I was counting down the miles but I wasn’t sure where the top was anymore. My miscalculation on the last 1.5 miles messed with my mind a bit. I was hungry when I crested so I ordered a fried egg sandwich from Mother’s. I thought it was a simple enough sandwich to make and it shouldn’t be long. What I didn’t know is that even though the restaurant was empty there was an order for five club sandwiches ahead of me. It took 15 minutes to get my sandwich . My stop at the top of Palomar was 20 minutes which WAY TOO LONG. I usually crest and IMMEDIATELY descend. But today I had to have lunch. Back to back hard climbing days are hard to stay fueled for on the bike. The ride back from Palomar was uneventful. I felt strong fighting the headwind all the way to the coast. The rollers in Rancho Santa Fe were fun too. I ended my ride at Nytro. My recovery meal was a grilled chicken pesto sandwich pannini– yummy. I ate my sandwich while I visited with my former coworkers. This entry was posted in climbing, Palomar Mountain by REV Cycling Directeur Sportif. Bookmark the permalink.